MSNBC’s Chris Jansing will anchor “Hardball” tonight at 5pm & 7pm, with a Hurricane focus. Thomas Roberts is on from 10pmET-Midnight. The network, which normally goes to tape on Saturdays and Sundays at NoonET will be in extended coverage all weekend. Veronica De La Cruz anchors early mornings, Alex Witt anchors until Noon, Tamron Hall from Noon-5pmET, Jansing from 5-10pmET and Roberts picks up at 10pm. FBN will be live Sunday night trying to tie Irene to business news. This entry was posted on August 26, 2011 at 11:36 am and is filed under CNN, FBN, FNC, MSNBC. You can follow any responses to this entry through the RSS 2.0 feed. You can leave a response, or trackback from your own site. 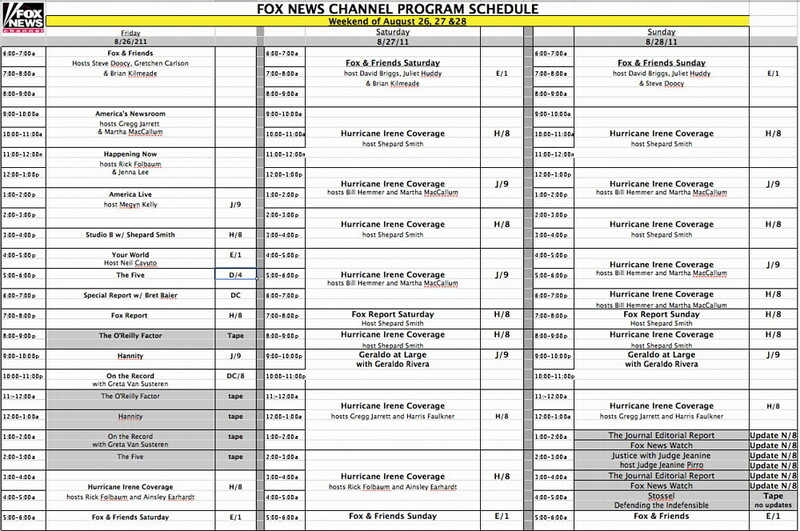 Aside from yanking the two shows I watch Sunday on CNN; Fareed Zakaria & Howie Kurtz; I don’t see much different. It’s nice to see the experienced and talented Martin Savidge get some air time though. Martin Savidge has been showing up on HLN a lot lately, reporting from some tropical location on the missing white girl. A waste of his talent. Juan Williams is on for Billo now, but the show is taped! By definition, shouldn’t weather coverage be live? Also, every time the media hypes up a story like this, usually it’s a tiny windstorm with no devastation, or the storm turns away back into the ocean. I hope that’s the case here, but boy are they hyping this thing!